Now that the Eclipse Gate fiasco is over, there's time for the guilds to all have a little break...but can Crime Sorcière really rest when they still don't know what happened to Ultear and can Rogue contain his angst when Frosch gets lost outside the guild? And all thoughts of relaxation are finished when Lucy's magic stops working as the weather in Earth-Land gets strange. What's this about a celestial spirit rebellion...? Not all anime-only arcs are created equal. Some feel like pure fluff filler, others attempt to fix an issue that didn't get enough time or attention in the manga, and still others fall in between. 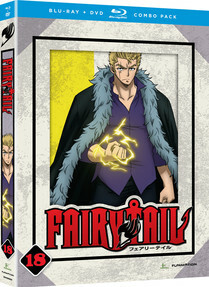 The episodes in this eighteenth DVD/BD release of Fairy Tail feel like they fall into the third category. Generally known as “The Celestial Spirits Arc,” this set of episodes tries to give us a more definitive consequence for Lucy and Yukino using all twelve of the Zodiac spirits to close the Eclipse Gate while setting up a bit of foreshadowing for the Tartaros Arc, which is the next major storyline in the manga. It has its moments of success, but it also gets too goofy and misses some good foreshadowing opportunities, making it fun but not nearly as good as it could have been. In more manga-based arcs of the series, there's a tendency to be more faithful to Hiro Mashima's original character designs, which, while they have some anatomical issues, at least manage to keep things from fluctuating in terms of size and quality. Anime-only arcs play a bit faster and looser with the character designs, and not only do these episodes feature quite a few off-model people of both genders, the breast sizes of the buxom women, most notably Lucy and Yukino, change from scene to scene, generally getting bigger. (If there was one thing I could do in the realm of the Fairy Tail anime, it would be to buy the buxom female characters all sports bras.) Added to the abundance of reused scenes, which only increases as the arc goes on, this is one of the poorest sets in terms of animation quality. Luckily the story itself isn't all bad. The set opens with the tail end of the previous arc, letting us know what happened to Ultear. It's well-handled, albeit dragged out a bit and less subtle than it could have been, and both English and Japanese VAs do a good job with her aged-up voice. What is striking about these episodes is the reactions of others versus Ultear's – her serenity compares with the others' grief in a way that drives home that “a good outcome” does not mean the same thing to all parties. This is a strong use of the aforementioned foreshadowing for later arcs, and any sting is nicely soothed by the humorous following episodes, one of which features a romantically frustrated “mole” (so they call it; clearly the word means something different in Earth-Land) and one of the strongest dub scripts of the set. While only a few of the fights could be said to move beyond “silly” into “stupid” territory – I'd argue that Wendy and Aquarius at the amusement park is one of them and Gray's dance battle with Cancer comes close, though it is saved by its sheer lunacy value – they also don't make the best use of the characters. Why, for example, place such emphasis on Virgo with Lucy when she clearly has deeper emotional ties to Loke and Aquarius? The only plausible answer feels like “fanservice,” and while that's not necessarily a bad thing, it also really is a missed opportunity to further explore and build the characters' relationships before the show returns to following the manga. With around fourteen more episodes in the arc, there is still time to make up for this, but on the whole, it is hard not to feel disappointed that this wasn't better used...or, conversely, made totally silly with no real substance, as elements of Cana's card battle with Scorpio has its moments when you realize that they are essentially playing the Calvinball version of Yu-gi-Oh. Fortunately this all does allow the actors for the zodiac spirits to show off some of their range, and special mention of Terri Doty's Virgo and Stephanie Young as Mama Pisces is merited as they really do a terrific job. As usual, the set comes with both a DVD and a BD version of the episodes, and both look good and have strong vocal work from both casts. The usual extras are present, with numerous clean endings and openings (to account for the special pin-up editions of the ending theme), trailers, and two episode commentaries, along with another guild profile, this time of Quatro Puppy. The commentaries are both very interesting this time around – the first, with Tyler Walker, Lydia Mackey, and Newton Pittman (whom one of the others calls “Newtie”), focuses on the physical toll of voice acting and how it can affect theater work, while the second is a Twitter Q & A with Cherami Leigh and Walker, where the questions range from interesting to silly and the two generally have a good time with all of them. Long-running series do often run up against situations where filler arcs are needed. How they handle them is more what matters than the fact that they exist, and this particular storyline is not one of Fairy Tail's best. It still has its fun moments, but overall it feels like a missed opportunity to do something that would have a bigger impact later on or to at least be totally goofy. Is it fun? Yes, relatively. Is it one of the better sets of Fairy Tail? Sadly the answer to that is no. + Redesigns for the zodiac spirits are neat, some very funny parts across the whole set. Good voice acting for the characters with multiple aspects. Ultear part is well done. − Art is frequently off-model and animation takes a nosedive, including lots of reused scenes. Story misses a few opportunities and never quite embraces its own goofiness.